« Maybe getting a Brazilian before that bike race was not such a good idea. Not even the beer deadened my bum. Even in Mexico, it seems that Fox News is not always imparcialidad y equilibrio. By definition, when I travel—as they say in those Southwest Airlines commercials—I wanna get away®. 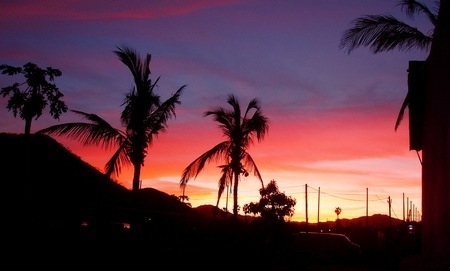 In my mind, the more exotic the locale, the less “here” it seems, which is exactly why I travel in the first place. The last thing I want to do is to hang out with a bunch of people “just like me”—albeit, likely not as good looking or as smart as me—in a setting that looks, for all purposes, just like a city near me, complete with American chain hotels and familiar looking corporate restaurants. If my goal was to just avoid mowing the lawn and dealing with other typical honey-do list items suggested by the wife person—and by suggested I mean, they better get done by the end of the day if I have any chance of eating dinner or sleeping in my own bed—well, I can drive a few miles over to Sacramento and check into the local Best Western, and dine at the downtown Denny’s. If all I am looking for is a swimming pool, late night bar, and midnight snack, they’ve got it covered. It is with that personal bias in my travel philosophy that, when trekking south of the border, I eschew booking trips to places such as Cabo or Cancun, Mexico. Both of those places are mega tourist magnets with miles of cookie-cutter high-rise beachfront hotels, occupied by platoons of sunburned, chaise lounge occupying vacationists, clutching over-priced, alcohol-light umbrella drinks. And, those locations have at least one other key similarity: the Mexican government officially sponsored both of these massive tourist traps through FONATUR, which is Mexico’s state agency in charge of planning and developing large-scale tourist projects. My only reason to fly to Cancun is to rent a car and head south into the Yucatan as quickly as possible, to places off the beaten path and visitation by cruise ships, such as Akumal, which still maintains a modicum of Mexican charm. 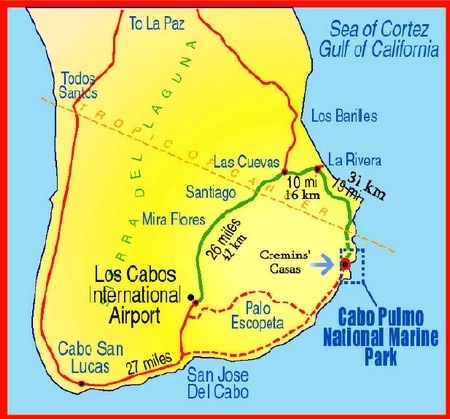 If you happen to catch me at the airport in Cabo, expect to see me quickly exiting the airport, getting past the armies of aggressive timeshare condo troops, and drive—not south towards the high octane area of Cabo San Lucas—but rather north, along the southern end of Baja’s East Cape, which skirts the stark shoreline, yet vibrant marine life of the Sea of Cortez, where my destination will likely be the rustic town of Los Barriles. While the Los Barriles area offers plenty of laid back housing, amazing local cuisine, miles of kite boarding and windsurfing beaches, nearby secret canyons with crystal clear cold water and cascading waterfalls, it is the nearby Cabo Pulmo National Marine Park that beckons me to don my scuba gear and immerse myself into the magical marine world that thrives just below the surface. 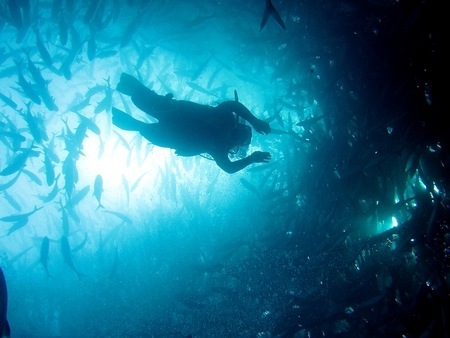 This area is home to the only coral reef in existence in the Sea of Cortez, and at an estimated 20,000 years old, said to be one of the oldest in this part of the Pacific Ocean. I have experienced numerous encounters with massive humpback whales with their clinging calves, frolicking schools of dolphins racing alongside and riding angled bow waves, squadrons of airborne manta rays splashing down in the shimmering sea and onto our dive boat, and stupendous schools of slivery jacks that darken the water by their sheer numbers. 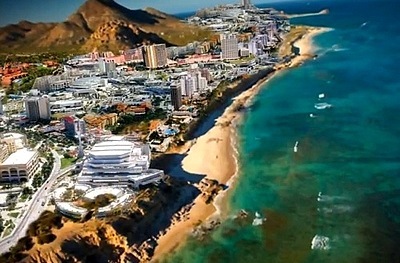 Thus, I had read with great dismay some time ago that the Mexican government had issued provisional permits for an enormous planned resort area, which involved almost 30,000 rooms on about 10,000 acres, in this unique area of Baja. Assuming, with the official backing of the government and deep pocketed developers, this would be yet one more corner of the world’s dwindling special wild places to be lost forever, I pleasured myself by recently reading that the proposed project was dead. While environmental issues were mentioned, interestingly, it is the financial crisis in Europe that may have had more to do with the collapse of the mega project than concerns about sea critters. 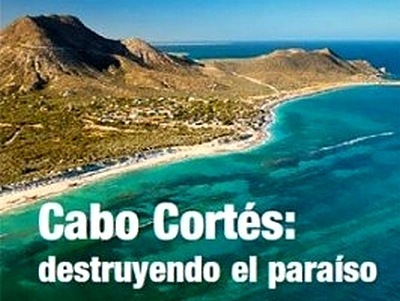 For many years, the once vibrant marine life of Cabo Pulmo suffered assaults from industrial scale fish mining, sometimes by foreign-based trawlers. In all good conscience, I cannot call those activities “fishing,” as they consisted of dragging huge nets along the sea floor, from which they cherry picked what they wanted, and discarded the rest to float away and die. It was thanks to Herculean efforts to protect the area that lead to tremendous strides towards not only recovery, but also now a return to a thriving marine environment. How much do I love this place? Check out the banner picture which has always sat atop of every travel story I have authored on this blogsite. That picture is looking out from a laid back beachside cantina in Cabo Pulmo where weathered, well-worn pangas take divers out to enjoy a magical part of the world that John Steinbeck and Jacques Cousteau recognized as one of a kind. Finally, I also found this picture on the web of what the area still looks like, along with a caution what might come. Gabe – thanks for the really nice comment, although I will continue to buy your beers up on the ski slopes anyway.